I love Persona 3 and Persona 4. They are some of my favorite games on the PS2, well-realized on both the gameplay and story sides of things. I also have greatly enjoyed the Etrian Odyssey series on the DS and 3DS. Though the two series are plenty different, such as Persona’s incredibly well written characters and Etrian Odyssey’s player created blank slates, they also have significant overlap. Both are fairly difficult dungeon crawlers, imbued with an old school sensibility that forces players to fend for themselves at times. The announcement that Atlus was making a game that combined the gameplay of Etrian Odyssey with the characters from those two Persona games was about the best thing I could imagine. While the end result was an excellent game, it didn’t quite live up to my exaggerated expectations. Everything combined nicely, except for the cast. There are just too many characters there for any of them to get their due. 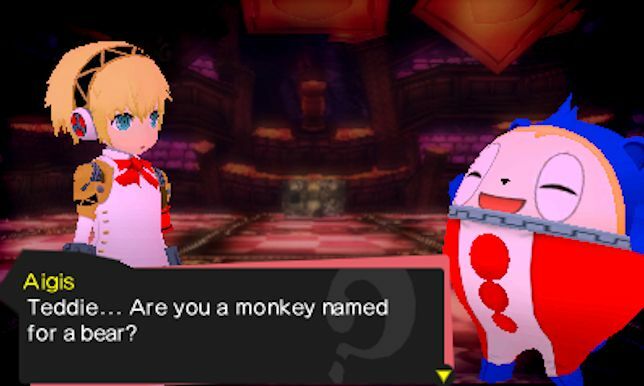 Persona Q: Shadows of the Labyrinth expertly turns the various systems of both Persona and Etrian Odyssey into an engaging gameplay experience, but can’t quite make room for all the characters in the story. The battle system is an odd mix of the two series. 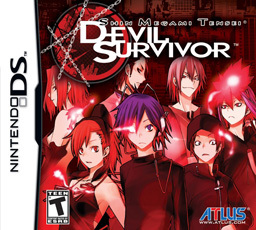 It has the Shin Megami Tensei series’ elements and focus on hitting weakness, but also Etrian’s binds. It uses Personas, but not in the same way that rest of the series does. Each character has their set Persona, but each character is allowed a secondary Persona. They don’t alter stats or anything like that; they are simply receptacles for extra skills and a slight HP/TP boost. The boost is the biggest quirk of the battle system. The bonus HP/TP regenerates at the end of every battle. It incentivizes using some skills in every battle, but not going all out. It is best to use one strong skill, which is essentially free, and finish battles quickly rather than get drawn into a long battle. The boss battles turn things on their head, though. Instead of quickly know outs, they are going to be long drawn out fights. They tend to be more frustrating than fun, since you have to change your strategy around completely to make it work. It is a battle system prone to wide swings in momentum. Critical hits or hitting a weakness gives that character a free use of a skill. If you can consistently hit weakness the battle turns in your favor, if not you drain your resources very quickly. It can be frustrating, when only a few battles sends you back to heal up, but when things are going right it is quite satisfying. Also, instant death magic in this game is stupidly overpowered. To make the majority of a breeze, just jam Naoto, who has both flavors of instant death magic, into your party and obliterate everything in your path. Combine it with the skill impure reach, easily available at low levels, and she destroys the game by herself. It makes it hard to look at anything else when one strategy is so overwhelmingly effective. The dungeon crawling is the best in any of the Etrian games, better than those in Strange Journey, the DS attempt at a similar style game. Each floor brings a new and tougher puzzle. 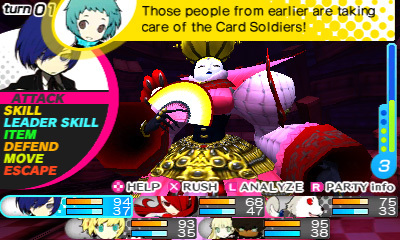 In terms of complexity, Persona Q’s floors start out near the middle of an Etrian game and work up from there. They tend to be very windy with specific puzzles rooms. The difficulty of the puzzles depends on the player’s fear of the FOEs. The game conditions players to fear them, but often if you treat them like a boss battle the FOEs can usually be defeated. They tend to hand out both drops for good equipment and a healthy chunk of experience, making it worth the player’s time. The story is the big disappointment with game is the story. I came in wanting to enjoy it, expecting to enjoy it. And to a certain extent it is. The central storyline, that of Rei and Zen and why the two teams are stuck in the dungeon is solid. Nothing too unexpected or groundbreaking, but it is a solid enough foundation to build this story on. The problem is with the characters. All of the returning characters from Persona 3 and Persona 4 are, in their own games, great characters. Combined, however, there are just too many of them, so none of them can get enough focus to feel real. It doesn’t help that none of them can actually change, since they have to go back into their own games from right where they disappeared. Really, there are just too many characters around. Only 5 can go in the party at once, but all 17 them talk as though you brought them along in the dungeon. So the whole cast gets reduced to one drop in characteristic. Teddy is after the girls, that is his only motivation. Chie likes meat, Akihiko protein and Rise the P4 MC. Some of them do come off better than others, though. Little Ken from P3 strikes up an unlikely friendship with P4’s Kanji. Occasionally Mitsuru gets through an uncharacteristic fun. Aigis was never my favorite character, but here her robot act, as overplayed as it is, is a fun counterpoint to the rest of the game. For the most part, the one-note cliché’s the characters are reduced to drop in far too often to to interrupt the player’s progress through the dungeons. A few times is okay, but it is constant and unceasing, making what should be a delight something that is more than a little frustrating. The last problem with the game is that it hangs around just a little too long. Persona Q took me about sixty hours to beat, but I stopped enjoying it after about forty five. I trudged through the last dungeon, which is fine on its own merits, continuing with the game out of a stubborn desire to not let the game beat me. I should have just let it go; I would likely have remembered it better. Now that I’ve beaten it, I like it again, but I don’t love it. If I were to redo my Top 10 list from last year, it would either move from where I put it at to slot 10 or just off the list at 11, or maybe just stay where it was. 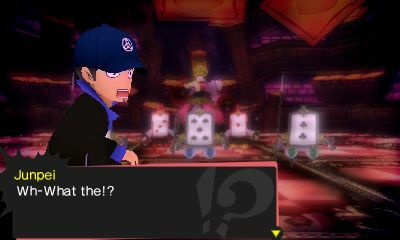 Persona Q: Shadow if the Labyrinth is as good as anyone should have expected it to be, but that doesn’t mean I didn’t get my hopes up way too high and set myself up for some slight disappointment. Last summer, for about two months I developed an intense infatuation with fighting games. They were all I played. I wrote a couple of blog posts about them, but apparently never managed to get them posted. Maybe I still have them somewhere, outlining my thoughts on about a half dozen different games, from my ineffectual struggles to become competent at King of Fighters XIII to my drunken mastery of Tekken Tag Tournament 2 to my surprising indifference to Street Fighter 4. 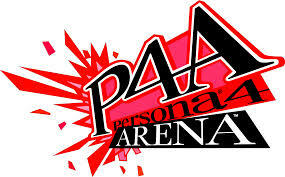 Also, my thoughts on the surprisingly single player focused Persona 4 Arena. I like fighting games, but I am no damn good at them. In fact, with a few exceptions I am downright terrible at them. I was quite good at Soul Calibur 2 at one point and with great effort I’ve managed to attain a level of skill at King of Fighters XI and XIII that I’d call “not embarrassing.” Otherwise, though, I am generally very bad. Still, I love the genre. The simple concept mixed with deep mechanics is interesting to me, even if I am unable to master those mechanics. Plus, they tend have some the most colorful characters and absurdly nonsensical stories around. 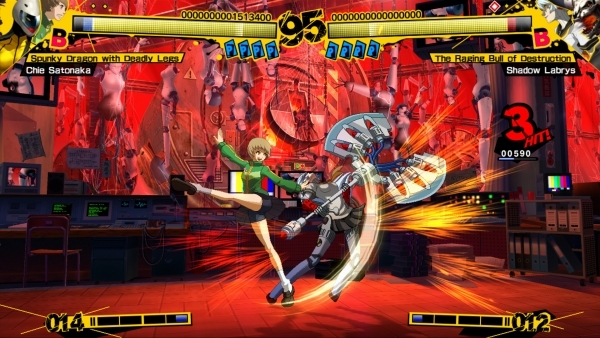 Persona 4 Arena has a colorful story but not a nonsensical one. For a fighting game fan who is inept enough to unable to really play other people, P4A is just about perfect. Persona 4 Arena is an extremely accessible fighting game. With its auto-combos and mobile characters, it is very easy to play. It verges on being as much as a button masher as Smash Brothers, but its simplistic surface hides a fighting system with significant depth. Again, I am no expert at exploiting those systems, but I can see them. What is amazing to me is how this game was constructed. Nearly all mechanics in this system are adapted from the Persona RPGs battle system. The Persona’s become some sort of Strikers, popping in to deliver special attacks. Status effects abound, with mute sealing off all attacks that use a persona and poison slowly draining a player’s life bar. On top of that, it does a great job of letting each character’s personality show through their attacks, from Teddy’s goofiness to Kanji’s formless brutality. The game is easy to pick up and play, but there is enough depth for fans of the genre to sink their teeth into. The big draw, at least for fans of the Persona series, is the story. The story in P4A is a fine, if inessential, addition and an effective bridge between P3 and P4. It plays out largely like a dungeon in Persona 4. Someone is trapped in the TV world, and the investigation team is drawn in to find them. At the same time, part of the crew from Persona 3 ventures in to the TV, chasing a disturbance, which is obviously the same person that the other crew is after. That person turns out to be a prototype of the same kind of robot as Aigis. With help from the other characters, this new robot, Labrys, manages to face her shadow and overcome her problems. Still, the group doesn’t find out who put Labrys in the TV in the first place, leaving a hook for the sequel that I didn’t expect to ever come, though I have been proved wrong. I was surprised that I didn’t hate Labrys. One of the things I liked about Persona 4 in comparison to Persona 3 was that it didn’t have any ridiculous stuff like persona using dogs or shadow fighting robots. Not that I didn’t like Koromaru and Aigis, but their presence kept P3 from having the verisimilitude that P4 had. When I saw that the first thing P4A did was add a robot to the P4 cast I was a little annoyed. After playing it, though, I found it worked well to bridge the two games. The P4 cast would show up when anybody appeared in the TV, finding a stolen, supposedly failed, prototype gives the P3 cast a reason to come running and join the other cast. Plus, Labrys’ story makes for a fine justification for the fighting nature of the story. Honestly, it was just good to see the P4 cast again. I was much more attached to them than the P3 cast, plus they were fresher in my mind. I actually bought the friendships between characters like Chie, Yosuke and Yukiko. Other than their relationships with the protagonist, I don’t remember that camaraderie between the P3 characters. Did Aigis ever have a conversation with Akihiko? I don’t remember. While this game’s story is not perfect, I was happy for any excuse to see these characters together again. As fanservice, P4A is basically perfect. It is a fun, accessible fighting game that exists mostly to provide an excuse to revisit the one of the most enthralling worlds to have ever existed in a JRPG. Shockingly, it also succeeds at being a solid fighting game too. It’s story mode it absurdly wordy, but it gives the fans what they want. I am eager to play the sequel, though I am unlikely to drop sixty bones on it.